It is not easy to live in cities with the worst climate, whether talking about incredibly high or too low temperatures, or about the places that are too precipitous, or without any rain or snow, or about the places that are very tricky when it comes to air humidity. Air conditioning Oshawa may help you at some point, but could you imagine living in a city where the temperature in November can reach 40 degrees Celsius? Although it seems almost impossible, if you read the list of cities with the worst climate to the end, you will see that there are such cities as well. The best thing is that, if you are not an inhabitant of these cities, you may avoid them whenever you travel, in order to avoid that extreme climate. On the other side, some of these cities are also extremely beautiful, so it would be more than recommended to sacrifice a little bit and visit them at least once in your life if you get the chance. So, let’s go straight to the list. If you don’t like summer and sun, and if you enjoy wearing jackets, coats, and sweaters all the time, maybe Reykjavik is the best city for you. However, you would for sure repent it at a certain point, if nothing, for the lack of D vitamin, as the hottest month here is July with the maximum temperature of 10 degrees Celsius. This is the holiest city for Muslims, and people from all over to world come to Mecca daily for the purpose of visiting its sacred places. 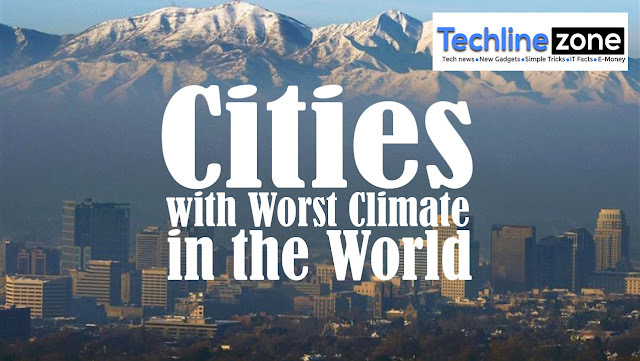 However, it is one of the hottest cities in the world, and the temperature in winter can range from 18 °C to 30 °C, while summer temperatures are extremely hot, often being over 40 °C during the day, dropping to 30 °C at night. Yes, I am sure that first thing that comes to mind when you think about Russia is how freezing it is, but if you take into consideration that Dudinka is located above the Arctic, you may just imagine the amount of coldness. A minimum temperature in January is minus 33 degrees Celsius, while the average high is minus 24.5 degrees Celsius. People here are more or less used to it, but those who come usually need more than one coat to make themselves warmer. This city is also close to the Arctic Circle, so you may immediately conclude that it is one of the coldest cities in the world. It has a subarctic climate, and the temperature in January can reach minus 32 degrees Celsius. The highest temperature measured during winter was minus 21 degrees Celsius, while the coldest ever measured was minus 51 degrees in 1947. It is impossible to talk about the cities with the worst temperature in the world, without mentioning Death Valley as one of the hottest cities in the world. This is also the driest place in the United States, and it reached its maximum in 1913 when the temperature reached 56.7 degrees Celsius in the summer. On average, temperatures during this hot season can reach 47 degrees Celsius, still being very hot and unbearable. For some cities around the world, the winter season isn’t just cold, it’s ruthless. With many of the coldest cities on Earth located in far northern latitudes, brutal arctic air is persistent, plunging normal low temperatures into the double digits below zero. Whether it's the vast Siberian tundra, the Canadian wilderness or far eastern China, residents in these locales routinely face some of the longest and most challenging winter seasons. Here are five cities that have some of the coldest winters in the world. Located above the Arctic Circle, Dudinka is a town along the Yenisei River in Russia’s Siberian territory. Home to more than 20,000 citizens, Dudinka is one of the northernmost cities in the world and thus faces extreme winter conditions. An average daily minimum temperature in January is minus 28 degrees Fahrenheit (minus 33 degrees Celsius), while the average high is minus 12 F (minus 24.5 C). Several years ago, parts of the town literally froze over during a powerful winter storm. Pipes burst causing the streets to flood while temperatures were reportedly minus 40 F (minus 40 C). This resulted in cars becoming encased inseveral feet of ice and snow. Winter weather is a part of the city’s DNA as each year it hosts the Hardin International Snow and Ice Festival, one of the largest ice festivals in the world. Normal low temperatures during January range from minus 8 to minus 12 F (minus 22 to minus 24 C). Temperatures as extreme as minus 44 F (minus 42 C) have been recorded during winter in Harbin. The capital city of the province of Manitoba, Winnipeg is home to more than 715,000 people and is one of the coldest major cities in North America. Situated in the Canadian Prairies, Winnipeg experiences normal January lows of minus 5 to minus 9 F (minus 20 to minus 22 C). Throughout its history, the city has experienced some of the most bone-chilling conditions imaginable. Temperatures as low as minus 49 F (minus 45 C) were recorded on Feb, 18, 1966 and minus 54 F (minus 47.8 C) on Dec. 24, 1879. The capital of the Sakha Republic of Russia, Yakutsk is home to some of the harshest winter conditions on Earth. Around 282,400 people live in the city, which is just a couple hundred miles from the Arctic Circle. The most extreme temperatures occur in January with an average ranging from minus 38 to minus 42 F (minus 38 to minus 41 C). The all-time record low recorded is minus 83 F (minus 64 C) in 1891. In addition, the winter season in Yakutsk can begin much earlier than other cities around the world. For Oct. 1, its average high is only 30 F (minus 1 C). Founded in 1934, Yellowknife is the capital city of Canada’s Northwest Territories, located on the shore of Great Slave Lake and about 320 miles from the Arctic Circle. Home to over 20,000 people, the city’s roots are based in the mining industry. During the winter, its northern heritage is on display through the ice roads that still provide transport to the community. Due to its subarctic climate, normal low temperatures during the month of January can reach minus 26 F (minus 32 C) in Yellowknife. Normal highs can struggle to get past minus 7 F (minus 21 C). The coldest temperature on record for the city is minus 60 F (minus 51 C) on Feb. 1, 1947. The city also boasts “long and clear” winter nights which provide optimal conditions to view the aurora borealis from mid-November to early April.